Gilbert M. "Broncho Billy" Anderson (March 21, 1880 – January 20, 1971) was an American actor, writer, film director, and film producer, who is best known as the first star of the Western film genre. Anderson was born Maxwell Henry Aronson in Little Rock, Arkansas, the sixth child of Henry and Esther (Ash) Aronson, both natives of New York. His family was Jewish, his father's parents having emigrated to the United States from Prussia, and his mother's from the Russian Empire. His family moved to Pine Bluff, Arkansas when he was three years old. He lived in Pine Bluff until he was 8, when he moved with his family to St. Louis, Missouri. When he was 18, he moved to New York City and appeared in vaudeville and the theater, supplementing his income as a photographer's model and newspaper vendor. In 1903, he met Edwin S. Porter, who hired him as an actor and occasional script collaborator. Anderson played three roles in Porter's early motion picture The Great Train Robbery (1903). Seeing the film for the first time at a vaudeville theater and being overwhelmed by the audience's reaction, he decided to work in the film industry exclusively. He began to write, direct, and act in his own westerns under the name Gilbert M. Anderson. In 1907 in Chicago, Anderson and George Kirke Spoor founded Essanay Studios ("S and A" for Spoor and Anderson), one of the major early movie studios. In 1909, he directed the film with the first known instance of the pie-the-face gag, Mr. Flip. Anderson acted in over 300 short films. 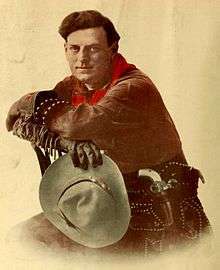 He played a wide variety of characters, but he gained enormous popularity from a series of 148 silent western shorts and was the first film cowboy star, "Broncho Billy." Spoor stayed in Chicago running the company like a factory, while Anderson traveled the western United States by train with a film crew shooting movies. Many of these were shot in Niles, a small town in Alameda County, California, south-east of San Francisco, where the nearby Western Pacific Railroad route through Niles Canyon proved to be a very suitable location for the filming of Westerns. Writing, acting, and directing most of these movies, Anderson also found time to direct a series of "Alkali Ike" comedy westerns starring Augustus Carney. In 1916, Anderson sold his ownership in Essanay and retired from acting. He returned to New York City, bought the Longacre Theatre and produced plays, but without permanent success. He then made a brief comeback as a producer with a series of shorts with Stan Laurel, including his first work with Oliver Hardy in A Lucky Dog (filmed in 1919, released in 1921). Conflicts with the studio, Metro, led him to retire again after 1920. Anderson sued Paramount Pictures for naming a character "Bronco Billy" in Star Spangled Rhythm (1943) and for depicting the character as a "washed-up and broken-down actor," which he felt reflected badly on him. He asked for $900,000, but the outcome of the suit is unknown. Anderson resumed producing movies, as owner of Progressive Pictures, into the 1950s, then retired again. In 1958, he received an Honorary Academy Award as a "motion picture pioneer" for his "contributions to the development of motion pictures as entertainment." At age 85, Anderson came out of retirement for a cameo role in The Bounty Killer (1965). For the last years of his life, he lived at the Motion Picture & Television Country House and Hospital in Woodland Hills, California. Anderson died in 1971 at the age of 90, at a sanitarium in South Pasadena, California. He was survived by his wife, Mollie Louise (Schabbleman) Anderson, their daughter, Maxine, and his sister Leona Anderson (1884–1973). He was cremated and his ashes placed in a vault at the Chapel of the Pines Crematory in Los Angeles. Anderson was honored posthumously in 1998 with his image on a U.S. postage stamp. In 2002, he was inducted into the Western Performers Hall of Fame at the National Cowboy & Western Heritage Museum in Oklahoma City, Oklahoma. For the past nine years, Niles (now part of Fremont), California, site of the western Essanay Studios, has held an annual "Broncho Billy Silent Film Festival." Anderson has a star on the Hollywood Walk of Fame at 1651 Vine Street in Hollywood. A Chicago Park District park, not far from the site of the Chicago Essanay Studio lot, was named Broncho Billy Park in his honor. ↑ "Bronco Billy Anderson is Dead at 88". New York Times. 1971-01-21. ↑ Aronson in the United States Federal Census, Pulaski County, Arkansas, 1880, Enumeration District 143, p. 303. ↑ Kehr, Dave (2000-01-16). "Sring Films / Actors-Directors; The Actors Who Have Two Faces". The New York Times. Retrieved 2015-02-23. ↑ Corneau, Ernest N. The Hall of Fame of Western Film Stars. Christopher Publishing House, 1969, p. 23. ↑ Katz, Ephraim. The Film Encyclopedia, 5th Ed. New York City: Harper Collins, 2005. pp. 35-36. ↑ Kiehn, David. (2003). Broncho Billy and the Essanay Film Company. Berkeley, Calif: Farwell Books. ISBN 0-9729226-5-2. , p. 162. ↑ Corneau, Ernest N. The Hall of Fame of Western Film Stars. Christopher Publishing House, 1969, p. 24. ↑ Los Angeles Times, January 21, 1971, Section 1, p. 2. ↑ Broncho Billy Silent Film Festival Archived June 16, 2006, at the Wayback Machine. Wikimedia Commons has media related to Broncho Billy Anderson. "Broncho Billy Anderson". Find a Grave. Retrieved August 10, 2010.